Add a little extra cozy warmth to your holiday decor this winter with these cool new Cable Knit Sweater Pillar Candles. 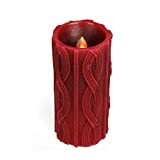 Rather than boring old smooth sided pillar candles, the heather gray wax on these is intricately molded to seem like they're wrapped in festive cable knit sweaters. They come in a set of two, each with a generous burning time of around 120 hours, and are handmade by artisans in France.